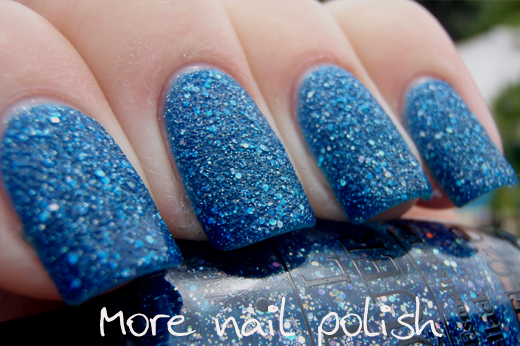 HMMMM, the Liquid Sand polishes. First up, what was your gut feeling about them? Me? Well I just knew I would surely hate them. 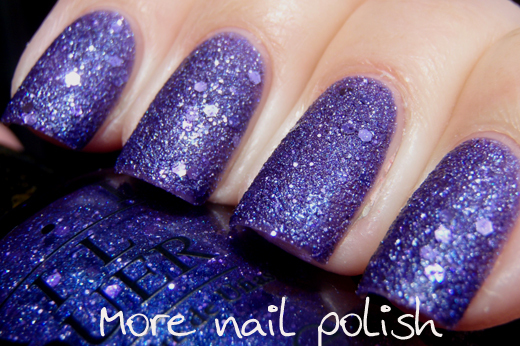 I mean a rough matte finish with glitters in it, yeah - no thanks. 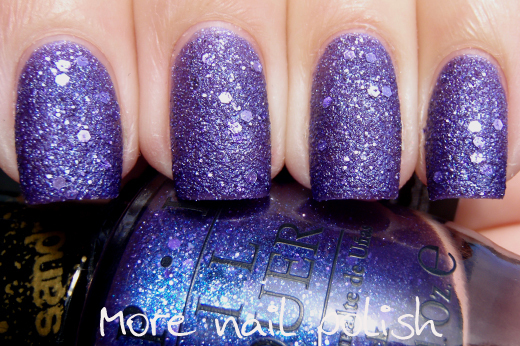 I already have a bunch of 'hungry glitter' polish exactly like that - hello Nubar Sparkles collection. But when I recently got the opportunity to review two of the Mariah Carey liquid sand polishes, I thought what the hell, lets give these a shot. Well colour me surprised, cause I was pants down shocked when I put each of these little beauties on my fingers. 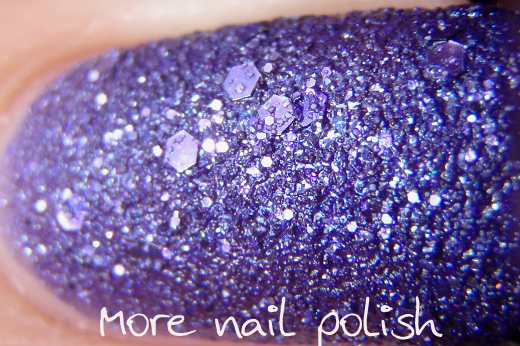 Can't let go - is a blue toned purple with blue and purple micro glitter and medium sized hexes. I'm not sure if the hexes are light purple or silver and just tinted by the purple base. The polish also has what can only be described and ultra fine sandy grit, or like powdered glass particles (if you have ever seen those). The polish dries matte and is very clearly a rough finish. 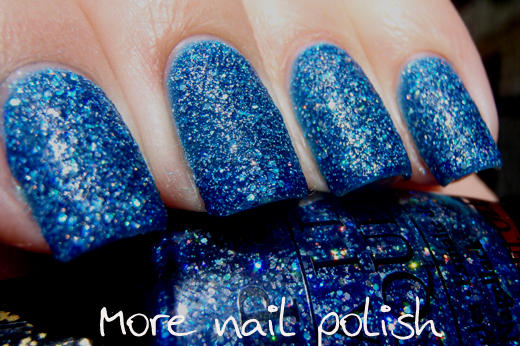 But the rough finish is actually smoother than a regular glitter polish with a rough finish. This is two coats on it's own. 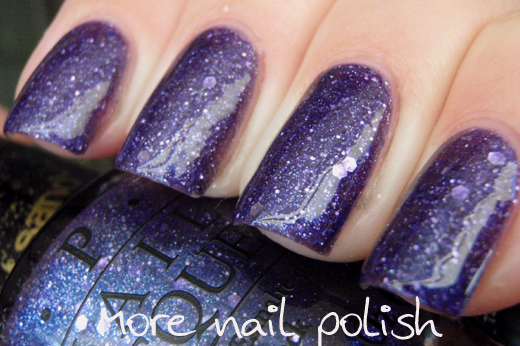 If every one's swatches of these they usually show the polish on it's own, and then with top coat on it. So, I did the same, although I did remove it straight after putting the top coat on, because I much preferred its original appearance. 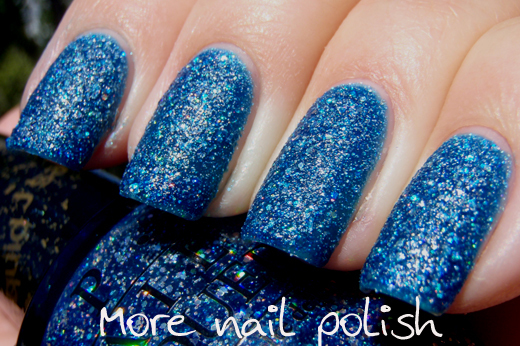 To get these polishes super glossy, you will need a lot of top coat. It is most definitely hungry and keeps soaking in as it dries. I did four coats of top coat for the photos below. I also found that top coat changed the colour slightly. It made it less of a blue purple and darker. 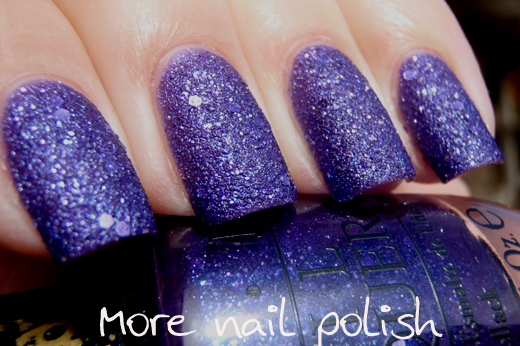 Get your number - I can easily see why this polish is starting to become the favourite liquid sand polish. The blue jelly base is just stunning and it's is nicely sheer enough to let the glitters sparkle through, whist still providing good coverage. 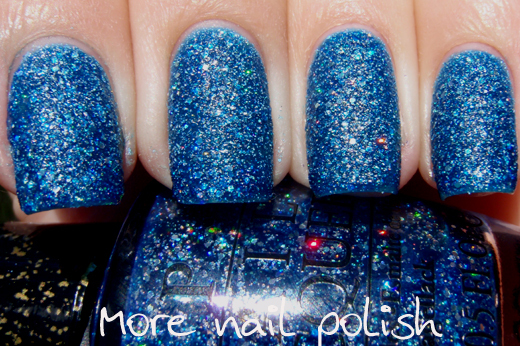 In the blue jelly base is both small and micro holographic silver glitter as well as the fine transparent grit. When you wipe your brush on the side of the bottle you can see this transparent grit on the edge of the bottle neck. This is three coats on it's own because this one was a little sheerer than Can't Let Go. These last three photos are taken in the shade. The polish looks nearly the same as it does in the sun because of the matte finish, however you don't see the holographic sparks in these shade photos. I am still wearing this polish right now, and I haven't put top coat on it cause I just love the way it look. Dry time - this was on the slow side. At two coats for Can't Let Go it tried in slightly slower than average time, but with three coats like on Get Your Number it was certainly quite a bit slower. You can tell when it isn't dry properly because it still looks glossy and not totally gritty. When it has completely dried these are very matte and quite sturdy. Removal - I was expecting the worse. I didn't put on a PVC base coat so I was really hoping I wouldn't have to get the foil out and soak for 10 minutes. I tried removing on just one finger and found that it came off very easily, only slightly slower than a normal polish and certainly no where near like a normal glitter polish. Yipppeee. No foil method removal required. So there you go. I've just proved to myself that I shouldn't be forming too strong an opinion on something based on other peoples photos and what I think I'm going to think of them. 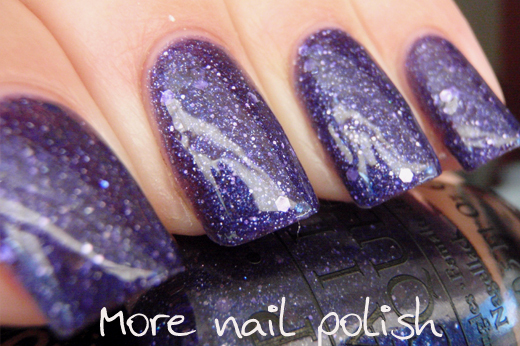 If you haven't tried these Liquid Sand polishes, I would really recommend giving them a go. I notice you can get a mini set with all four of the liquid sand polishes, I reckon that is a good way to go. I've recently seen a bunch of other brands coming out with textured finishes, but so far most, if not all of them have been creme polishes with the textured finish, not glitters in a jelly or crelly base. I'm not convinced I would like a creme polish with grit in it, but the proof is right here that I just might like it if I tried it. 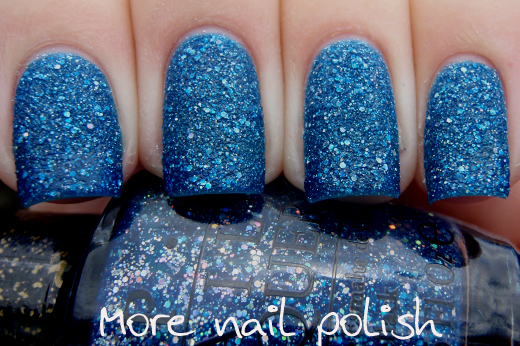 Have you tried a textured polish yet? What are you feelings about them? Ive got these both and i absoluty love them. They last long even though i work in a shoe shop!! I am loving the Liquid Sand polishes! I can't wait to see more colors they put out with this finish! Love them personally! 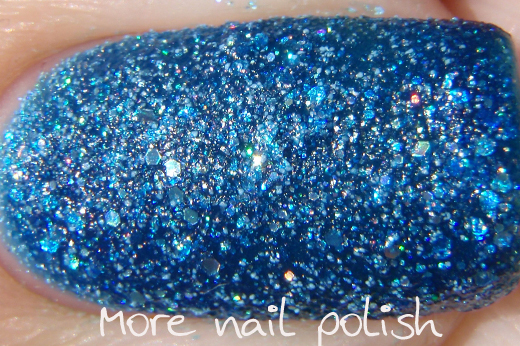 I like the Liquid Sand a lot more than the regular creme textured polishes coming out because of the glitter also! 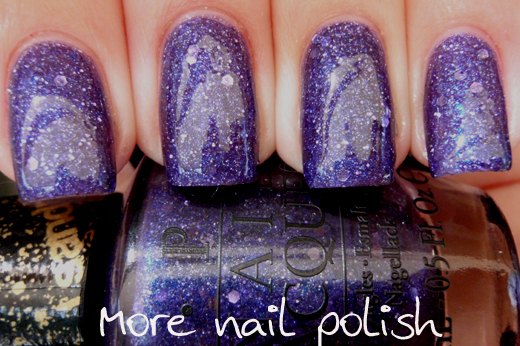 Although I'm a top coat person, I think I could step outside my comfort zone with these - they really are very pretty. It's interesting how quickly we can form a biased opinion before knowing all the facts or experiencing things for ourselves. I have all the liquid sands and I like them a lot. I like that the topcoat really changes the look - it's like having 2 polishes in one. I was right there with you. No way! I can't do matte polish for more than a few hours and my glitters must be perfectly shiny! So glad I tried these because I'm in love! Get Your Number is my fave. And the hexes in Can't Let Go are silver. Found that out when I was cleaning up my cuticles in the shower. The purple flaked right off. No worries, though. I can't wait to try the Pixie Dust! I have all the opi liquid sands and gumdrops too. I love them. Fastest paint job on the planet. Lasts longer. I take vinylux top coat and go over the tips in varying widths. Wears like gels.